It’s estimated that millions of men, women, and children suffer from TMJ Disorders. Headaches, facial pain and clicking of the jaw joints are the most common complaints from those afflicted with a TMJ dysfunction. And pain is not necessarily associated with this problem! TMJ is an abbreviation for the Temporomandibular Joint, the hinge joint more commonly known as the jaw. This joint, located slightly in front of each ear, is composed of the temporal bone, the mandible, and the disc. This sliding joint, capable of great flexibility, allows for the jaw to be moved by the facial muscles in a wide range of directions. Unfortunately, your TMJ condition may worsen with time if you do not seek proper treatment. Most patients are not aware that there are specially trained dentists to treat the problem. Worn, chipped teeth, whether in the front or back teeth. 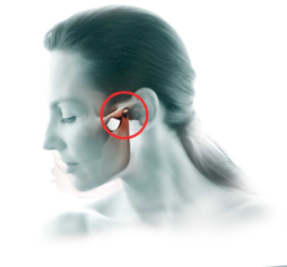 TMJ problems develop from some type of injury and are not hereditary. These TMJ related problems may occur at a very young age from a fall, sport injury or motor vehicle accident just as with an adult. In other words any type of whiplash-type injury, whether mild or severe can cause the injury. And the injuries are cumulative, meaning several small injuries from which you recover quickly may cause a larger problem years later. What really happens is that the disc (which is a cushion between the skull base and the head of the jaw) becomes dislocated because it is held in place only by a very thin Saran Wrap-thin sheet of ligament. Appropriate occlusal splints (night guards) to help relieve TMJ muscle tension and create joint support. Specific nerve block injections, muscle trigger point injections to address specific local areas of pain source. Chiropractic therapy to address the spinal misalignment which can contribute to headache, neck or back pain. Restorative dentistry to rebuild worn, damaged teeth. Orthodontic care to straighten teeth to put them in their most ideal position to help with joint stability. If the injury is deemed severe enough, corrective surgical measures may be necessary. This would be to prevent further changes in muscular or bone structures. In young children, TMJ injuries can lead to improper growth causing facial deformities and alterations in the bite.